Things are a looking a little better for Snapchat in its latest earnings report, after its Q3 update seemed to indicate a broader downward shift. 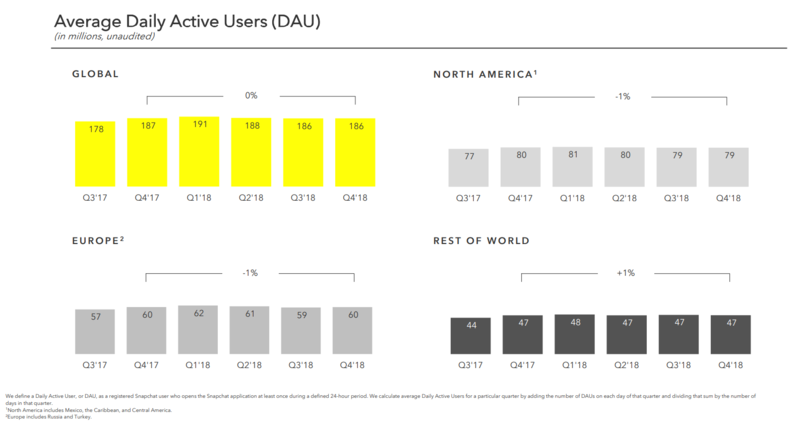 In Snap's Q4 and full-year report card, there's more reason for optimism - though significant challenges still remain to boosting platform growth. First off, on user numbers - Snap didn't add any more daily actives, but it didn't lose any either, which is a positive within itself. Usage also remained stable in all markets, which underlines the platform's enduring popularity, despite challenges from Facebook and Facebook-owned Instagram. While obviously gaining more users is the aim, losing more in this report would have pointed to a rising trend, which would have spooked the market significantly. As such, by merely maintaining users this time around, the narrative around Snap hasn't had a chance to solidify, enabling more cause for optimism and potential. "70% of users played with or viewed a Lens every day, while users played with or viewed Lenses 700 million times on New Year’s Eve, up nearly 40% year-over-year." Snap's Lenses remain a big winner, and a key opportunity for connecting with the platform's audience. If you've not considered the possibility of creating your own branded Snap Lens campaign, it may be worth another look, with improved, simplified tools making the option accessible to more businesses. "Bitmoji Stories, a new cartoon starring Snapchatters and their friends, reached over 40 million viewers in December." Bitmoji Stories was launched by Snapchat in November last year. The story on the revenue side was even more positive, with Snap reaching a new record of $390 million for the quarter, up 36% year-over-year. Particularly important is that 'Rest of the World' stat, which increased by $18 million after actually declining last quarter. The overall result beat Wall Street expectations of $378 million. "Snap has managed a 68% year-over-year improvement in its adjusted EBITDA losses, which came in at $50 million (though net loss was still $158 million). 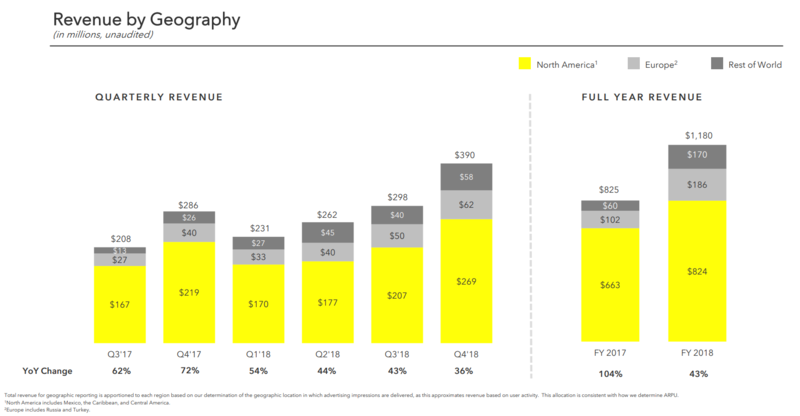 With 43% full-year revenue growth in 2018, “this limited our Q4 losses to just 13% of our revenue, compared to just one year ago when our Q4 losses totaled more than 50% of revenue” CEO Evan Spiegel wrote in his opening remarks." That's important, because based on previous results, Snap has essentially been on track to run out of money at some stage in the near future. By reducing its losses, it may well be able to maintain viability, without having to push for another funding round. Another key point of note is Snap's Average Revenue Per User, which shows that the platform is making more money in more regions. The concern for Snap has been that, while North American revenue has been relatively strong, its lack of growth in other markets could become limiting, if it were unable to shift it. Where Facebook has seen significant growth in recent times, for example, is in Asian markets, which are reflected in Snap's 'Rest of World' category above. Snap has grown significantly in this area, after posting a reduction last time around, and it will likely need to push harder on this front to maximize its revenue potential. Of course, some of this growth is expected due to increased digital ad spend over the holidays, so it's not 100% indicative that Snap is on the right path just yet. But the numbers are promising - again, the company's Q3 report looked fairly dire, with the way forward becoming more clouded by competitor growth. This time around, at least the data shows that Snap is getting its business in order - it may not be out of the woods, but the performance figures are stable, and do indicate potential, if Snap can keep moving in the right direction. In other Snap news, the company is also moving forward with a re-build of its Android app, which could help it gain more users. "Early test results are promising, especially on less performant devices, including a 20% reduction in the average time it takes to open Snapchat." There's still much to be seen, the challenge ahead of Snap remains significant. But signs are looking better for the formerly ephemeral content app.